Apparently the bone-dry hilarity that is Strindberg and helium has been online forever. So I guess you already know about it. If you don’t, or are anyways feeling in the mood for some funny and depressing animated poetry check it out. 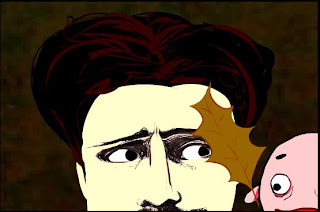 Watch “the super-dour Swedish playwright August Strindberg.” wax gloomy about autumn. Along with, of course, his irrepressibly bubbly helium balloon. Here’s a fun idea: write your own melancholy seasonal verse and leave it in the comments! Winter comes like the ripper. All shrivel at his advance. Seasonal suicide, to risk not his icy hand. Even the bear, sleeps deep.